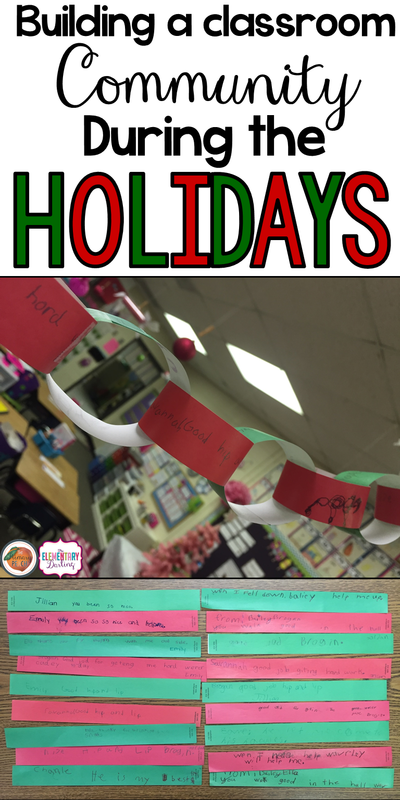 The Primary Peach: Building a Classroom Community during the Holidays! Building a Classroom Community during the Holidays! Hey Y'all! It's Erin from The Elementary Darling. The holidays are upon us. I am so excited to spend some family time over Thanksgiving! During my Thanksgiving break, I always plan my December lessons and make a wishlist of items that I will need to complete crafts, snacks, or activities with my students.I send home my wishlist before December. Some may say that I over plan, but the holidays are crazy enough as it is. We MAP test and benchmark test in December. Add that to the crafts (that you strategically matched to your standards) and the excitement and it gets a little crazy in the classroom. 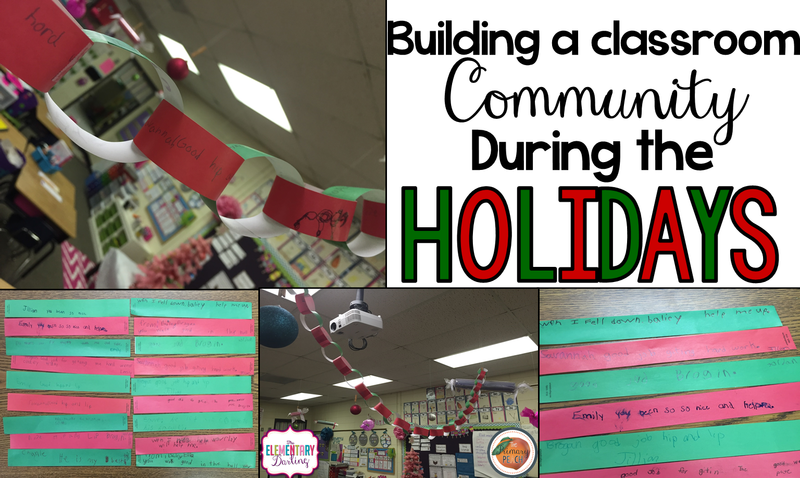 So today, I am going to share my favorite idea to build your classroom community during the holidays! With all of the business, my students started getting stress some of my friends needed a little reminder to be nice and thankful. I wanted to spread joy and love throughout my classroom while building our classroom community, because let's be honest, we work on this ALL.YEAR.LONG. So I decided we would build our classroom community by writing nice things about our friends on our paper chain. TWO in ONE deal my friends! You get classroom decor AND kindness from students in one fell swoop. We filled our room with these strips. Each day, the students would receive two pieces of paper. They were encouraged to write to different people each day, We filled them out in our "spare time" and I asked them to watch their friends to see all of the wonderful things that each of them were doing during the day. I read them and the kids loved hearing all of the fabulous things people were saying about them. I filled them out as well so that all of the students would have great things said about them. Each afternoon, I would add the strips and the students would watch our chain grow and decorate our classroom. They loved it, and so did I. It really brought out all of those good Holiday Feelings. The best part is, you can do this for very little cost! You can use cut strips of construction paper. If you don't want to do that, you can get the ones that I used from Oriental Trading. They have some really cute ones here or the plain red and green ones here. How do you build your classroom community during the holidays? Leave us a comment and let us know the wonderful things that you do in the classroom! Happy Holidays, Friends! Great idea, decoration class is an important part of the holiday. I ordered here livingwisdomschoolassisi.com greeting essays for my friends they were just delighted with the wish that I had read to them. These are good instructions but I find it difficult to be productive all the time. Moreover, it`s impossible cuz, I work a lot. That`s why this platform http://paidpaper.net/cv/ so convenient when there is no time to study at college. I can do that with Kahoot?